Nouha Dicko struck for the second time in two games as 10-man Wolves held on to beat Brentford at Molineux. Dicko opened the scoring when he raced on to a long ball and fired a low shot past Bees goalkeeper David Button. A James Tarkowski own goal doubled the hosts' lead before Kevin McDonald was sent off for a second bookable offence. Danny Batth put the ball in his own net to give Brentford hope but they were unable to equalise, leaving Wolves three points off the play-off places. After a run of five consecutive defeats, Wolves have now picked up 10 points from their last four games. When Bakary Sako and Nouha Dicko have both started, Wolves have won eight, drawn two and lost two. When the duo have not started, Wolves have won two, drawn five and lost five. Brentford almost took the lead early on when Carl Ikeme tipped Jota's strike on to the post, but it was the home side who went ahead almost immediately afterwards. A high, looping ball forward from Kortney Hause was latched onto by Dicko, who beat the offside trap and struck a composed, low shot past Button. Brentford had the better of the play either side of the break, but Alex Pritchard's header wide was the closest they came to an equaliser. Wolves doubled their lead when Rajiv van La Parra headed on to the crossbar and, as the ball bounced down into the box, the on-rushing McDonald trickled an effort towards goal only for Brentford's Tarkowski to send it in to his own net. McDonald was then shown a second yellow card for a late tackle, giving the Bees new belief. They pulled one back when Jake Bidwell's low centre took a cruel deflection off Batth and went past Ikeme for an own goal. Andre Gray struck the post in added time but Wolves held on to secure a third win from their last four games, while the Bees fell to their second straight defeat. 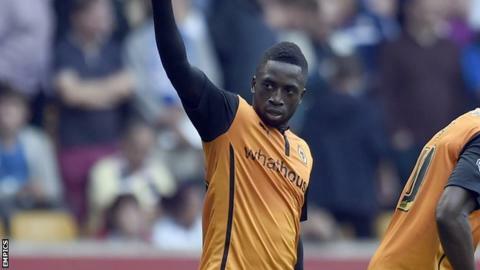 Wolves manager Kenny Jackett on Nouha Dicko's goal: "I have seen it again and yes, he was offside. But we have been on the wrong side of some decisions in recent weeks, particularly here. "So we have to roll with the punches in terms of refereeing decisions and they do come and go for you during the season." Brentford manager Mark Warburton: "You don't mind mistakes - because you learn from them - or outstanding quality, but the guy is three yards offside. "I appreciate we have the luxury of seeing replays but you can't make mistakes like that at this level. We looked dangerous and and I am staggered we have come away with nothing." Match ends, Wolverhampton Wanderers 2, Brentford 1. Second Half ends, Wolverhampton Wanderers 2, Brentford 1. Corner, Brentford. Conceded by James Henry. Andre Gray (Brentford) hits the right post with a header from the centre of the box. Assisted by Sam Saunders with a cross. Attempt blocked. Moses Odubajo (Brentford) left footed shot from outside the box is blocked. Assisted by Sam Saunders. Attempt blocked. Sam Saunders (Brentford) right footed shot from outside the box is blocked. Attempt saved. Moses Odubajo (Brentford) right footed shot from outside the box is saved in the bottom right corner. Substitution, Wolverhampton Wanderers. Matt Doherty replaces Bakary Sako. Attempt saved. Jake Bidwell (Brentford) header from the left side of the box is saved in the top centre of the goal. Assisted by Moses Odubajo with a cross. Own Goal by Danny Batth, Wolverhampton Wanderers. Wolverhampton Wanderers 2, Brentford 1. Corner, Brentford. Conceded by Danny Batth. Substitution, Wolverhampton Wanderers. Leon Clarke replaces Rajiv van La Parra. Substitution, Brentford. Sam Saunders replaces Alex Pritchard. Corner, Brentford. Conceded by Richard Stearman. Attempt missed. James Henry (Wolverhampton Wanderers) left footed shot from the right side of the box is close, but misses to the right. Assisted by Rajiv van La Parra. Attempt saved. Alex Pritchard (Brentford) right footed shot from outside the box is saved in the centre of the goal. Assisted by Jon-Miquel Toral. Attempt missed. Bakary Sako (Wolverhampton Wanderers) left footed shot from the left side of the box misses to the right. Assisted by James Henry. Attempt missed. Alan Judge (Brentford) right footed shot from outside the box misses to the left. Assisted by Alex Pritchard. Second yellow card to Kevin McDonald (Wolverhampton Wanderers) for a bad foul. Attempt blocked. James Henry (Wolverhampton Wanderers) right footed shot from outside the box is blocked. Assisted by Rajiv van La Parra with a headed pass. Attempt missed. Alex Pritchard (Brentford) left footed shot from outside the box is high and wide to the left. Assisted by Jonathan Douglas. Alan Judge (Brentford) is shown the yellow card for a bad foul. Own Goal by James Tarkowski, Brentford. Wolverhampton Wanderers 2, Brentford 0. Attempt saved. Kevin McDonald (Wolverhampton Wanderers) right footed shot from the centre of the box is saved in the centre of the goal. Rajiv van La Parra (Wolverhampton Wanderers) hits the bar with a header from the centre of the box. Assisted by Dave Edwards with a cross. Foul by Kortney Hause (Wolverhampton Wanderers). Toumani Diagouraga (Brentford) is shown the yellow card for a bad foul. Corner, Wolverhampton Wanderers. Conceded by Tony Craig.